With a global portfolio of eleven brands that encompasses 638 properties in 52 countries, the role of social and customer engagement can be both tricky and overwhelming for Hyatt. 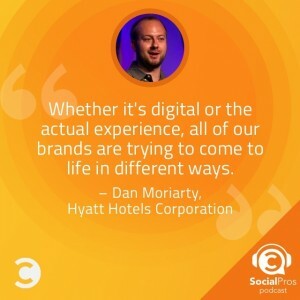 Luckily, they have Dan on their side who has crafted an approach to social that meets customers in their venue of choice, places importance on human-to-human interaction, and keeps the goal of caring for their customers central to every engagement. Supported by a robust training program, his social style has led to a team of employees, from the corporate hub to individual locations, that understand and embrace the hotel’s mission in customer care and are trusted to advocate accordingly. Not many things move faster than social these days. Beyond needing to have platform and business knowledge, Dan stresses the importance of a willingness to jump in. Nothing can replace a little elbow grease and it’s important to be known as that reliable person who will roll up his/her sleeves and get things done. An avid soccer fan, Dan would choose Lionel Messi for his Social Pros Skype lifeline. Getting a chance to understand what goes into Lionel’s level of dedication to his craft would be fascinating and a conversation ripe with life lessons.